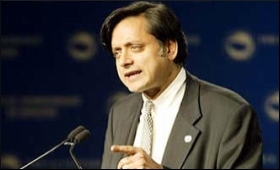 Tharoor has often been criticised as an "English-speaking elite" and therefore his emphasis on Hindi, the language spoken or understood by a majority in the northern part of India, bears immense political relevance. A regular at the Jaipur Literature Festival, he addressed a session on his last book "An Era of Darkness," which has, incidentally, also been translated into Hindi and therefore engaged with the audience here in the language. Later, he addressed a press conference and took questions from the visiting media. Speaking mostly in Hindi, with brief corrections in English where required, the Congress MP who represents Thiruvananthapuram in Parliament said that "this is going to be the last Budget of his (Modi) government," and some desperate measures like creation of jobs may be anticipated from the Budget. Tharoor made a direct attack on Modi by saying: "Jisne kaha ki na khaunga aur na khane dunga, who aaj pakode ki baat karne lage hain. Woh nahi samajhte ki log chai aur pakode isliye bech rahe hain kyonki jobs nahi hai (The one who said he will neither be corrupt nor tolerate corruption is today talking about pakodas. He does not understand that people are selling tea and pakodas only because there are no jobs)." Notably, in a recent interview to a television channel, Modi had answered criticism over not creating enough jobs by saying a pakoda seller earning Rs 200 a day should also be considered employed. Responding to a question on Congress President Rahul Gandhi, Tharoor said that "we must give him time to review" the measure of his party. Meanwhile, his sustained attack on the ideology of Hindutva continued on the second-last day of the Jaipur Literature Festival. He reiterated that there is a need "to take back Hinduism" from the practitioners of Hindutva, while also highlighting that Hindutva and Hinduism are totally different. "Hinduism does not teach violence and people who attack and lynch others cannot be Hindus, they are anti-Hindus," he said. The fulcrum of Tharoor's latest book rests on an argument which seeks to establish a narrative that an average Indian's belief in Hinduism is not in sync with that of Hindutva. He ends his book by arguing that there is a need to "take back Hinduism," and has propelled a relentless critique of the ideology in almost each of his recent public appearances.